The small group of GMOs that are well-known and hotly debated are those used in agriculture. While many seem to argue whether or not they should exist, the fact is genetically modified crops are already all over the place. In 2006, for example, 252 million acres of transgenic crops were farmed in 22 countries by 10 million farmers. Of these, 53% were grown in the United States, where the United States Department of Agriculture (USDA) keeps a close watch on the total area of GMO seeds planted. Genetically modified plants totaled as high as 86 percent of corn, 90 percent of the soybean, and 93 percent of upland cotton planted (by area). It’s not just developed nations that are growing GMOs: according to the International Service for the Acquisition of Agri-Biotech Applications (ISAAA), 90% of the GMO-growing farmers in 2005 were resource-poor farmers in developing countries. So what, exactly, are these farmers planting? The majority are soybeans, corn, cotton, canola and alfalfa that carry genes that either make them tolerant to the herbicides glufosinate and glyphosate or produce the insecticide Bt toxin, a compound originally from bacteria that is a widely used pesticide by organic farmers. Why should we want GM foods around in the first place? For one, they have the potential to make the production of certain crops cheaper and even more environmentally friendly. But really, what we have done so far is child’s play compared to what we may be able to do in the near future with GM crops. On the horizon are a variety of crops that could revolutionize agriculture, and not just in cost-saving ways like insecticides and herbicides. Sweet potatoes are being engineered to be resistant to a virus that currently decimates the African harvest every year, which could feed millions in some of the poorest nations in the world. Rice is being created which is high in iron and vitamins to supplement the diet of the malnourished masses in many areas. Similarly, scientists have created carrots high in calcium to fight osteoperosis, and tomatoes high in antioxidants. Almost as important as what we can put into a plant is what we can take out; potatoes are being modified so that they do not produce high concentrations of toxic glycoalkaloids, and nuts are being engineered to lack the proteins which cause allergic reactions in most people. Even more amazingly, bananas are being engineered to produce vaccines against hepititis B, allowing vaccination to occur where its otherwise too expensive or difficult to be administered. Just for the record, not all GM crops are made to be eaten; some trees, for example, are being modified to produce plastics, of all things. The benefits these plants could provide to human beings all over the planet are astronomical. Most genetically modified animals are used for scientific research, as I explained in the first segment of this series. But GM animals don’t just live in labs. The first GM animals for commercial sale were glow in the dark zebra fish, now quite popular in freshwater aquariums (you might call them GloFish). GM animals aren’t just for show, though – some are making their way onto our dinner plates. Like for their floral counterparts, the use genetically modified animals as food is hotly debated. Right now, the most likely GM animals on the verge of wide-scale sale are fish. Fish are becoming more and more popular as a source for protein. By 2015, it’s expected that the world demand for fish and fish products will expand by 50 million tonnes to over 180 million tonnes per year. That is a lot of fish. As worldwide fish stocks continue to collapse, it’s expected that much of this will come from aquaculture, and GM fish are ready to swim into the market through these farms. Aquabounty Inc., for example, has developed genetically modified salmon called AquAdvantage™, which are capable of reaching maturity twice as fast as their unmodified counterparts. Similarly, transgenic sockeye salmon have been given an extra growth boost, as have transgenic carp and tilapia. These animals have yet to hit supermarket shelves because of concerns not only for their safety to humans but also their ecological safety to their wild counterparts should some escape. 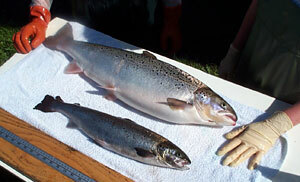 Already, non-transgenic farm fish pose threats to some species of fish, and studies have found that the offspring between enhanced and wild fish are compromised compared to natural offspring. Those in favor of GM fish, however, say that these farms can be restricted to land-locked areas to reduce risk, that the GM fish can be sterilized, and that the benefits of these faster-growing fish overwhelmingly outweigh the risks. Fish aren’t the only animals being modified for food. Farmed mammals, too, are being genetically modified. Cows are being created which increase the calcium content of their milk by producing more casein proteins. Pigs are popular targets: some are being cloned to produce omega-3 fatty acids which are normally found in fish, and separately others are being modified to express a phytase which breaks down phosphorus to reduce the environmental impact of their feed. Pigs are even being engineered to contain high vitamin C levels. Transgenic chickens now express an enzyme so they can eat lactose-containing feed, widening their possible food options. While these animals aren’t for sale yet, either, they have the potential to make meats more affordable, more environmentally friendly, and more nutritious. Unlike plants, GM animals are not widely available or currently on supermarket shelves. However, that is expected to change in the near future, once further tests have been done to determine their safety. The major concern that most of us have is whether GM crops are safe. It is, literally, a billion dollar question. The vast majority of the anti-GMO platform is that they’re not. The main basis of this opinion is that because GMOs contain genes that produce proteins otherwise never found in a given food, they are likely to be dangerous. For example, foreign protein products may cause allergic reactions in people. A case often cited as proof that GMOs are inherently dangerous is Pioneer Hi-Bred’s GM soybeans that were being developed in the ’90s. Pioneer Hi-Bred introduced genes from Brazil nuts into soybeans to increase the level of sulphur-rich amino acids. While the product was intended for animal feed, not human consumption, it became clear during testing that the nut protein that was being transferred was an allergen to humans. Because of this, the company discontinued development. People also believe that, since many plants are being engineered to produce pesticides, the overall consumption of these health hazards will be increased if GMOs are eaten regularly. As it stands, the science is mixed, but most supports that these foods do not cause adverse health affects. Feeding trials have found little to no toxic effects and studies have documented that GM foods have the same nutritional qualities as unmodified versions. Perhaps the most supportive evidence of GM crops’ safety, though, is simply that we’ve been eating them for 15 years in the US and have yet to see population-wide adverse effects. Despite the evidence towards their safety, public support for GM crops remains low, and many say that we can’t really know whether they’re safe with the tests that are done now. To that end, there is a lot of variety in the regulations and studies of the effects of eating GMOs (I’ll explain that in my next post). Many, including myself, believe that more rigorous and standardized testing is necessary, as it would build consumer confidence in the safety evaluations and lead to much wider spread acceptance of GM foods. While I understand the worry about Frakenfoods, I think it’s important to look at the bigger picture. DNA is a part of our diet. We eat millions of copies of thousands of genes every day, most of which science has yet to determine the products of. We breathe in even more microorganisms and other microscopic creatures that have all kinds of unknown proteins in them, and we rarely stop to worry if they will have an adverse impact on our health. Moreover, we do eat many of the genes being transferred around between GM species. The fact is, most proteins get chewed up beyond recognition in our stomachs (this is why most health supplements don’t actually work). We must take the debate about the development of GMOs very seriously, and critically analyze the risks that come with them. But at the same time, we must also avoid being hysterical about the issue, and tackle the assurance of their safety with science and reason instead of rhetoric. To that end, we must ensure that they are safe via thorough testing and regulation. What are we doing about that? Next post I’ll explain the complex system that is GMO regulation, particularly in the US, so you can have a better idea about what analysis GM products go through before they end up on supermarket shelves. Its nice article guys about Frankenfood.